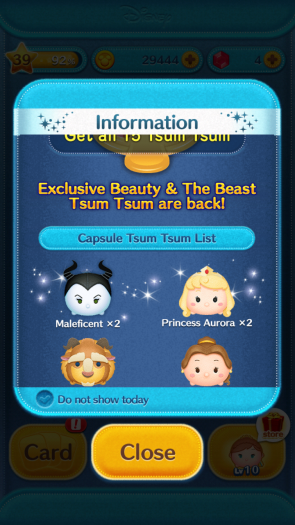 Home » News » Pickup Capsule in the Disney Tsum Tsum App! Pickup Capsule Update now in the Disney Tsum Tsum App! Exclusive Beauty & The Beast Tsum Tsum are back! Maleficent x2: Clears Tsum Tsum in a chain! Princess Aurora x2: Prince Phillip Tsum Tsum appear and can be connected to Princess Aurora Tsum Tsum! Beast x2: Clears a diagonal line of Tsum Tsum. Belle x2: Clears Tsum in a heart shape! Lumiere x3: Clears random Tsum Tsum! Gaston x2: Clears Tsum Tsum and lots of Gaston Tsum Tsum appear! Mrs. Potts x2: Transforms Tsum Tsum into Chip Tsum Tsum and they can be connected to Mrs. Potts Tsum Tsum. 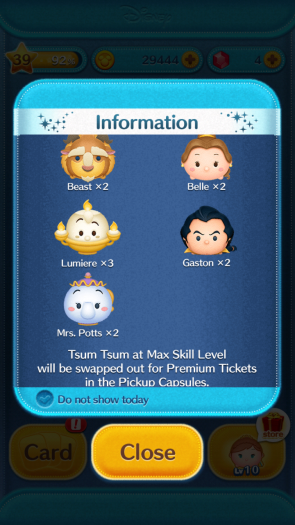 Tsum Tsum at Max Skill Level will be swapped out for Premium Tickets in the Pickup Capsules. If you draw all the Pickup Capsules you get the last prize: Skill Ticket! New Pickup Capsule Update in the Disney Tsum Tsum App! New Pickup Capsule in the Disney Tsum Tsum App! Pickup Capsule in the Disney Tsum Tsum App! 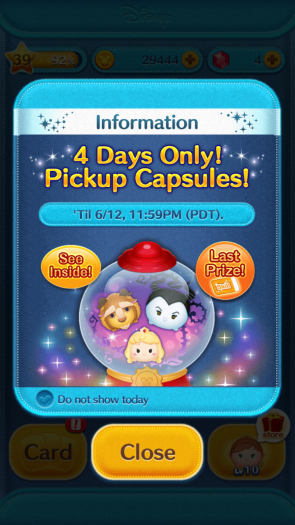 Pickup capsule update in the Disney Tsum Tsum app! Pickup Capsule Update in the Disney Tsum Tsum App! Pickup Capsule Update in the Disney Tsum Tsum Japan App!